JNN 02 Sept 2014 Riyadh – People in Saudi Arabia are becoming increasingly interested in the Islamic State of Iraq and the Levant (ISIL), a sign of which is writing the slogans of the terrorist group on schools’ walls by Saudi children, a Saudi Arabian newspaper said in report on its website on Sunday. The daily Al-Hayat reported that despite numerous measures adopted by Saudi officials to deter he threat of ISIL to the kingdom, Saudi children and youth are becoming increasingly interested in the group’s symbols and slogans. The use of ISIL mottos in the internet is on the rise as many Saudi children and youth continue to republish them on their pages in social media, the daily reported. The most frequent ISIL phrase used in the media is a slogan in which the group is described as “resilient, undefeatable and victorious.” The phrase has been reportedly written on the walls in a number of schools in the Saudi capital Riyadh. The daily also says that according to a recent poll conducted in the oil-rich kingdom more than 92 percent of the people see the ISIL activities as religiously legal. The Saudi Monarchy is about to fall in the trap it Dug for others , as the ISIL Terrorists who even follow the same Wahabi Mythology which was dictated to them by the Saudi Monarchy , but they are still a threat to the Kingdom as over the Years Religious Section of the Saudi Kingdom , is getting More and More Powerful every day as the Saudi Monarchy in its lust for power has Invested Heavily in the Religious Section to develop the Wahabi Mythology for their Hegemony in the World Power , and due to which now the Religious Portion has become so much so Powerful that it has become a threat to the Ruling Monarchy . And there have been a tussle for Power between them , and if it grows with in Saudi Arabia , it may tear it apart into Bits and Pieces . 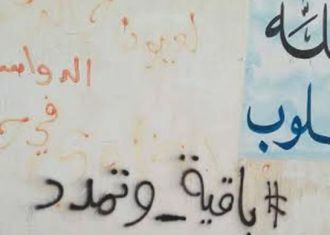 This entry was posted in Jafria, Middle East and tagged ISIL Graffiti, Saudi Arabia, Saudi Arabian newspaper, saudi capital riyadh, Saudi Kingdom, saudi monarchy, Saudi officials, Saudi Schools, Terrorists. Bookmark the permalink. THEN THE ISIS , ISIL SHOULD NOT BE ALLOWED TO STAY EVEN FOR A DAY MORE. THEIR DREAM OF RIVVAL OF A KHILAFAT E GHAIR RASHIDDOON SHOULD BE NIPPED IN THE BUD . THEIR SEPERATE ISLAMIC DEMOCRATIC GOVERNMENTS WITH A COMBINED DEFENCE AND A BEAUTIFUL MUTUAL COOPERATION OF ALL KINDS . LET SUCH GOVERNMENT WELCOME THE REAPPEARANCE OF IMAM E ZAMANA (hjtf) . WHAT ELSE WE CAN WISH AND PRAY . I am certainly not pro ISIS or Islam but I must the Saudi Royals have a lot to answer for as do other elite’s in the Gulf States Iran and UAE. Let us hope it will be sooner than later.